Ascending Butterfly: November: Ascending Butterfly Book Club Review and Giveaway - THREE TITLES - Build your library! November: Ascending Butterfly Book Club Review and Giveaway - THREE TITLES - Build your library! This giveaway is now CLOSED. Thank You so much to our wonderful sponsor, Hachette Book Group! We would love to work with you again! The winner has been notified and upon winner confirmation, follower name will be posted both here and on our homepage. Remember: There are still some great giveaways active on the upper right hand side of the page! Ascending Butterfly Book Club is coming at you with a vengeance for November with not just one, but THREE titles for your reading pleasure! Best Part: Winner takes them all! With help from our friends at Hachette Book Group we are going to help you build your library! Grab a cup of Joe or Hot Chocolate and curl up on the couch with your favorite throw! 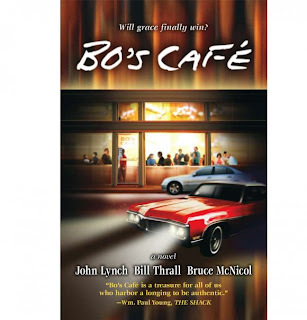 First Up: BO'S CAFE by John Lynch, Bill Thrall and Bruce McNicol. High-powered executive Steven Kerner is living the dream in southern California. But when his bottled pain ignites in anger one night, his wife kicks him out. Then an eccentric mystery man named Andy Monroe befriends Steven and begins unravelling his tightly wound world. Andy leads Steven through a series of frustrating and revealing encounters to repair his life through genuine friendship and the grace and love of a God who has been waiting for him to accept it. A story to challenge and encourage, BO'S CAFE is a model for all who struggle with unresolved problems and a performance-based life. My Impressions: I read this title first, and I will say I devoured it. Quickly. It was a good read and a much needed read. In these troubled times, words that encourage and inspire are sorely needed. We all struggle with something, and sometimes it's difficult to find the perspective we need to sort through it all, Bo's Cafe provides the words in that way, that special way that makes sense of it all. If only there was a Bo's Cafe in my neighborhood! No spoilers here, just my recommendation. Margaret and Patrick have been married just a few months when they set off on what they hope will be a great adventure-a year living in Kenya. Margaret quickly realizes there is a great deal she doesn't know about the complex mores of her new home, and about her own husband. A British couple invites the newlyweds to join on a climbing expedition to Mount Kenya, and they eagerly agree. But during their harrowing ascent, a horrific accident occurs. In the aftermath of the tragedy, Margaret struggles to understand what happened on the mountain and how these events have transformed her and her marriage, perhaps forever. A Change in Altitude illuminates the inner landscape of a couple, the irrevocable impact of tragedy, and the elusive nature of forgiveness. With stunning language and striking emotional intensity, Anita Shreve transports us to the exotic panoramas of Africa and into the core of our most intimate relationships. My Impressions: Several friends had recommended I read this book and I hadn't had the chance to do so at the time, but now I see what all the fuss was all about! (My apologies friends, but I finally did get around to it!). 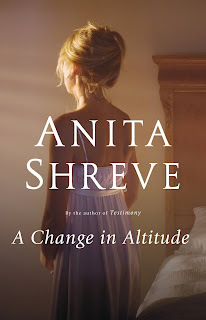 All I can say is this is my first Anita Shreve title and will not be my last! It's certainly a powerful introduction! Some writers are very engaging in the way the character dialogue is written, and A Change in Altitude is very much powerfully written in a voice that makes you feel very much part of the experience. Again, no spoilers here, I hate when people spoil books and movies for me, and I will not do it to you! I will recommend you read A Change in Altitude! 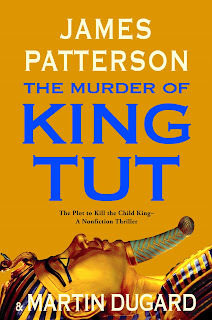 Final Title: THE MURDER OF KING TUT - The Plot to Kill the Child King - A Nonfiction Thriller - by James Patterson & Martin Dugard. Thrust onto Egypt's most powerful throne at the age of nine, King Tut's reign was fiercely debated from the outset. Behind the palace's veil of prosperity, bitter rivalries and jealousy flourished among the Boy King's most trusted advisors, and after only nine years, King Tut suddenly perished, his name purged from Egyptian history. To this day, his death remains shrouded in controversy. Enchanted by the ruler's tragic story and hoping to unlock the answers to the 3,000 year-old mystery, Howard Carter made it his life's mission to uncover the pharaoh's hidden tomb. He began his search in 1907, but encountered countless setbacks and dead-ends before he finally, uncovered the long-lost crypt. Now, in The Murder of King Tut, James Patterson and Martin Dugard dig through stacks of evidence--X-rays, Carter's files, forensic clues, and stories told through the ages--to arrive at their own account of King Tut's life and death. The result is an exhilarating true crime tale of intrigue, passion, and betrayal that casts fresh light on the oldest mystery of all. My Impressions: I am not an Egyptologist, and kept putting this title off because I anticipated a very scholarly undertaking that might not have held my interest very long. I feared this would be one of those books, that mid way through I would end up putting down. I did make it through, but will warn those looking for a scholarly undertaking, this is not what you are looking for! And for those afraid of it because they thought it would be a more scholarly read, I say, don't be afraid, it's not what you thought either! For lovers of Patterson's detective writing, this is a HUGE departure. It doesn't grip you the same way the detective books do. I've read some pretty harsh criticism regarding this title and I personally feel it's un-warranted! Writing is an art, and the artist has every right to change brushes and canvases every now and then! WIN IT! - 1 reader will receive all three books! Please leave your email address somewhere in your comment. (You can format it this way for security, example: ascendingbutterfly AT mail host DOT com), if your blogger profile has your email you can just indicate this in your entry. If your comment name, and your follower name are different, please indicate this as well. Please follow directions or you will be disqualified! All comments are moderated, so no worries if your comment doesn't appear on the site right away. This giveaway is open to bloggers and non-bloggers alike, but you must follow this blog for your entry to count. You have from now until Friday, December 04, 2009 at 11:59 PM (EST) to comment and be entered for a chance to win. Winner will be announced shortly after Wednesday, December 9th! Giveaway open to USA only, 18+. I follow your blog and I follow each book on Twitter. My Twitter name is @Hurdler4eva! I am a follower of Ascending Butterfly and am following all three books on FaceBook. (Johnica1). I follow you (via google) and am a fan of each book/author via facebook. I am a follower of your site and I am following the books on Facebook! I voted for you in the Downy contest! I voted for you for the Love This Site award! I am following Bo's Cafe on Facebook! I am following Bo's Cafe on Twitter! I am following A Change in Altitude on Facebook! I am following The Murder of King Tut on Facebook! I am following A Change in Altitude on Twitter! I am following The Murder of King Tut on Twitter! I am following king tut on facebook. I am following bo's cafe on facebook. I am following I am following Anita's book on facebook. I'm following your blog and following each of the books' twitter accounts as moziesme. I follow your blog. I follow Bo's Cafe, A Change In Altitude, and The Murder of King Tut on Facebook. I follow your blog (and changed my user name to /\Heather/\, just to see if you can finally see me), and decided to follow all three books via twitter (choochoo428). Follow Bo's Cafe on Facebook.